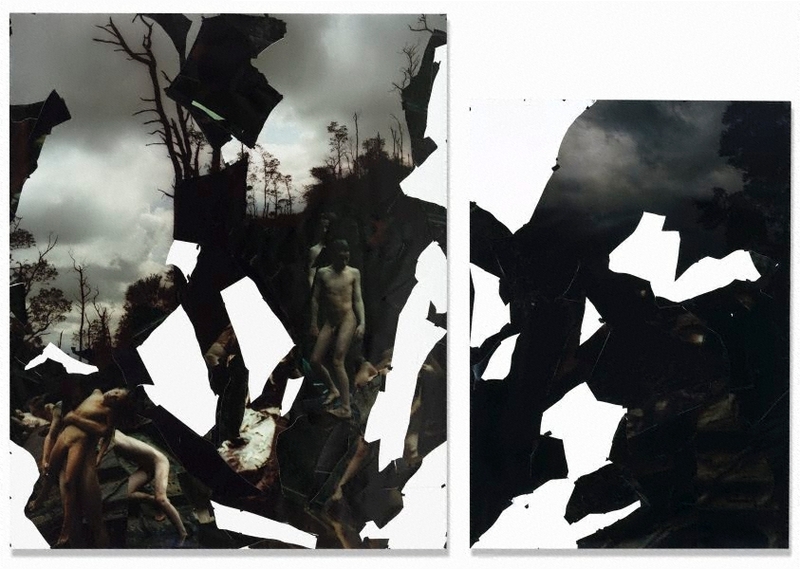 This diptych is an important companion to the single work (Untitled 1994/1995 221.1996). It was completed a year later but it remains within the series which was exhibited at the Biennale of Venice in 1995. Henson’s ‘cut screens’ of the mid 1990s allow for disorienting effects of both flesh and ground on a scale that he had not attempted previously. 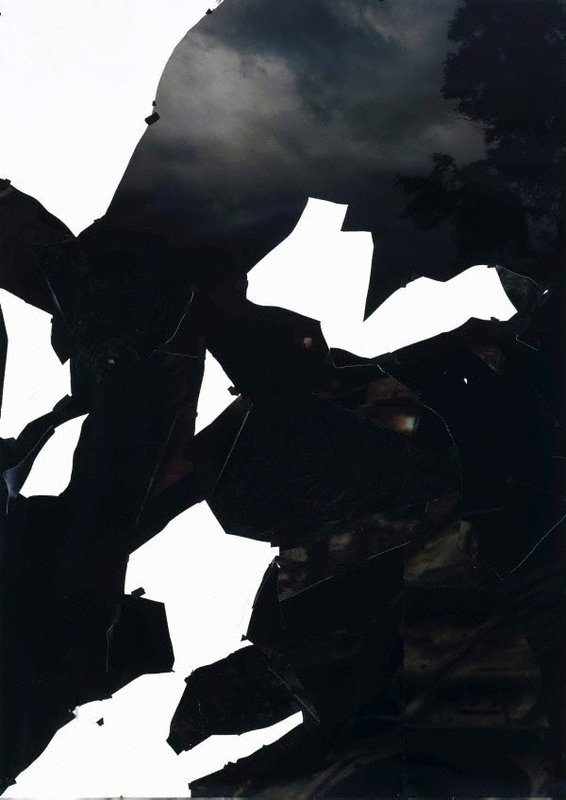 Bodies and landscapes are cut up and what had been manipulated through the camera lens or in the darkroom was pushed to extremes through the use of collage: white shards of photographic paper stuck down with layered images taken at various places and times. 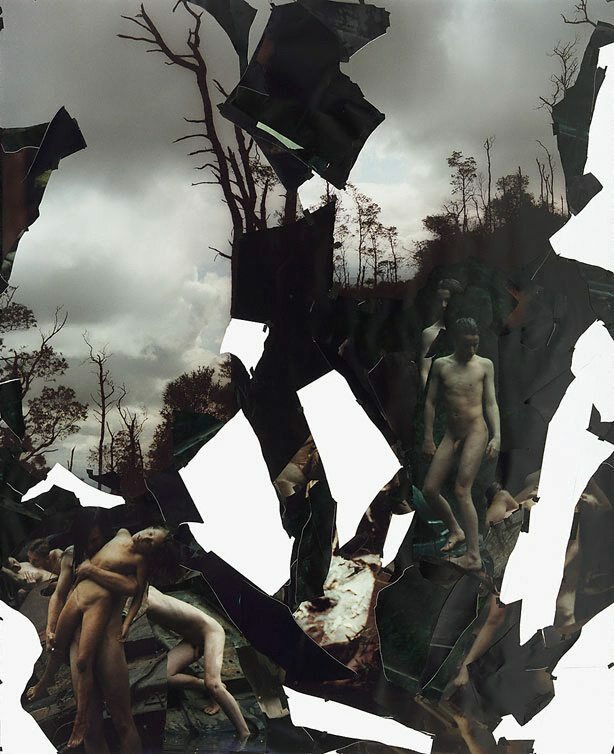 In these, bodies merge into each other and into the landscape. Sometimes the effect is Arcadian, at others infernal. The profusion of figures sinking into the darkness, set against mountain peaks or remote city vistas, and sliced with white can produce the shock experienced before paintings of flayed carcasses, or the fascination caused by glimpses of distant forms dappled with light. Signed and dated c. verso [a], black fibre-tipped pen "...Bill Henson...1995/96...". Signed and dated c. verso [b], black fibre-tipped pen "...Bill Henson...1995/96...". Mnemosyne , Sydney, 2005, 424-5 (colour illus. ).